They produce caskets and it turns out to be the only place they can relax and take a nap. It is amazing to find people who say sleeping in a casket usually associated with the dead gives comfort. When it is time for you to take a nap in the afternoon, your bed or a mat placed on the floor is usually a great option, but for these men, lying in a casket gives comfort, the kind you will never imagine. While you dread the casket and do not want to look at it a second time when you see it, as it reminds you of death, some men lay in it and find comfort which you seek from your bed. It was raining, and the thunder rumbled in the sky, sending its vibration which shook the foundation of their workshop. There was no way they could work at the time, so, a young man simply identified as Desmond lay in a beautiful golden coloured casket, his legs hanging on the lid. He slept peacefully oblivious of happenings around him. They are specialists in casket making, but by the side, they also make chairs, tables, wardrobes, cupboards and black boards in order not to only commune with the dead, as people see them. The name casket reminds one of death and funeral while people who make caskets are called furniture makers. The nature of their job has become a challenge they deal with on a daily basis. They have complained of how some people mistake them for ritualists because of the nature of their job and the fact that they sometimes have to catch a nap in some of the caskets, like they are testing it out before the final occupant is laid to rest with it. Bounce News visited Odoko Royal Casket located along Mbiama-Yenagoa Road, opposite House of Assembly Complex in Amarata Yenagoa, Bayelsa State. On that day, Desmond had scrapped the surfaces of two skeletal coffins and decided to rest. He lay in one of the polished caskets and fell asleep. His colleague, simply identified as 'Undertaker', explained that a finished casket is usually soft and cosy. "The size of the casket makes it warm. "It is comfortable," he concluded. Differentiating between a coffin and a casket, another casket maker, Mr Emmanuel Denden, revealed that a coffin was the sketch while a casket is the polished and finished work. This craft brings money, as a casket could cost as much as 250,000 Naira, but with the money comes the big challenge, which Emmanuel also identified. Emmanuel told Bounce News that it was difficult for them to woe a lady at their place of work. He gave the names and prices of different design of caskets and coffins. 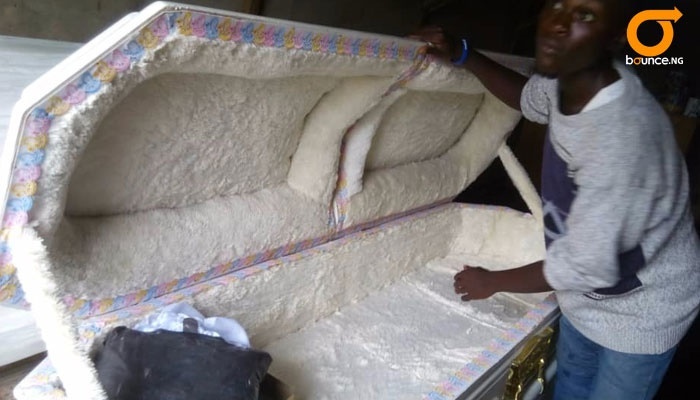 "Emergency coffin is rough and sold between 20,000 and 25,000 Naira. "Bible casket made of ply wood cost between 60,000 and 90,000 Naira. “Some Bible casket made of hard wood and milling golden handle cost as much as 150,000 Naira. “While Masonia wood casket built from draft work cost 250,000 Naira because of the hard wood and handle,” he explained. Emmanuel said he learnt how to build caskets in 2005, but stressed that education was still in his mind. "I want to further my education," he said. One joke people make with people who are into casket making is that they pray for people to die, but Emmanuel said it is not the case. Their prayer line is different. "Death is a natural occurrence, but we only pray for people to make money and buy casket to bury their dead relatives. Mr Alagoa Maxwell, who was at the workshop to purchase a casket, said it was expensive, but unfortunately, in Nigeria, so much has been attached to burials that people spend a lot of money to bury the dead. It is usually tagged a celebration of life, especially when the dead is aged, with well to do children and even grand-children. People also believe that it is the last respect to give to the dead, ensuring that the corpse sleeps peacefully in a casket.